Your goal here should be to minimise risk and cost while maximising flexibility. 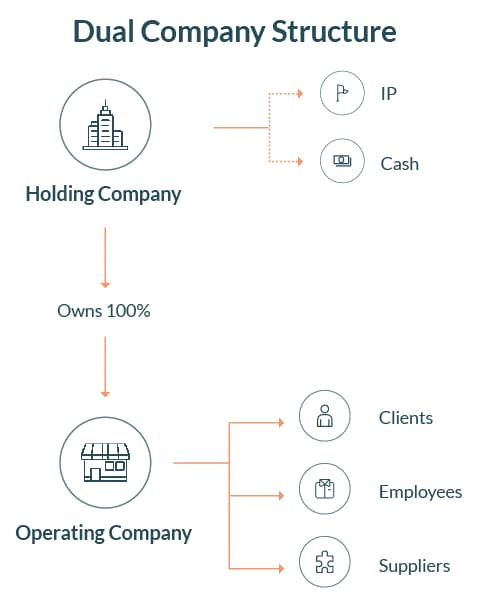 A dual company structure involves a holding company that owns 100% of the shares in a subsidiary operating company. An operating company is the entity that enters into contractual arrangements with clients, suppliers and employees. The holding company will generally own the startup’s intellectual property (IP), as well as any recently raised capital. A dual company structure makes sense because, in most circumstances, the holding company generally protects the startup’s major assets (IP and excess cash) from any liability that the operating company incurs. In the scenario where a customer sues your startup, then they will have to sue the company that they have the legal relationship with (i.e. the operating company). In a dual company structure, an operating company will hold fewer assets. While you cannot anticipate being sued, this extra layer protects your company’s most valuable assets. Setting up a holding company requires incorporating an additional company. Consequently, it is costlier to implement and maintain. There are also some limited instances where the holding company may be responsible for an operating company’s action/inaction, such as fraud or other improper conduct, or if the companies are found not to be under separate management in the event of liquidation. Founders can use a discretionary trust to own their shares in their startup (rather than owning them personally), which makes sense for several reasons. Asset Protection: If you are a director of your startup, you could be held personally liable for debts incurred under certain circumstances (e.g. fraud and wilful negligence). Owning your shares through a trust rather than in your own name offers some protection to your shares. However, if debtors are at a stage where they are going after you personally rather than the company, your shares in the startup are likely worthless (unless, of course, you have a dual company structure to protect the business’ assets). 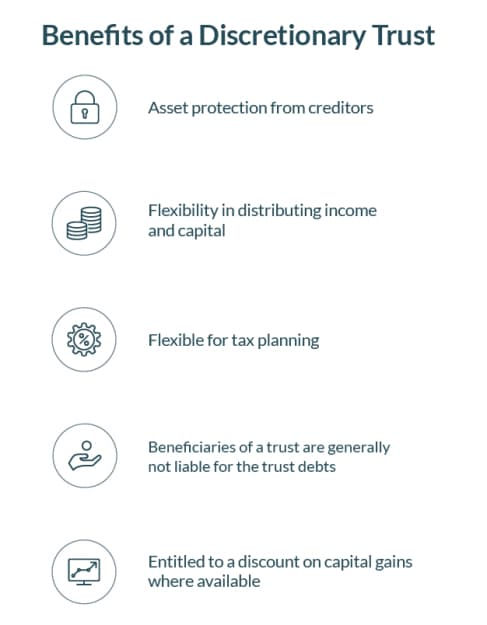 Tax Planning: In the event of a significant exit, or if your startup chooses to distribute dividends (which is unusual but not unheard of), a trust can be more tax efficient than owning the shares personally. 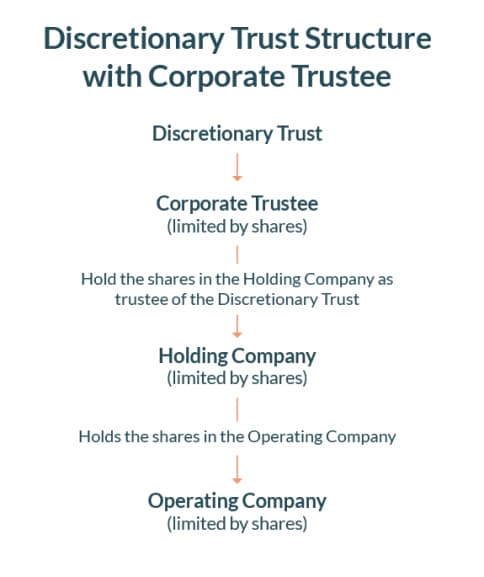 The trustee has the discretion to distribute the trust income. So, the trustee can distribute to beneficiaries with lower marginal tax rates (e.g. a partner who isn’t working) for tax planning reasons. When setting up a discretionary trust, you will need to consider whether you wish to appoint an individual or corporate trustee. While a corporate trustee allows for additional protections (particularly, limited liability), this requires you to incorporate another company and increases your setup and maintenance costs. Importantly, you cannot be both the trustee of a trust and the sole beneficiary. A trust structure will then only make sense where there are other people (e.g. family members) who you can distribute income to under the trust. So, if you have a partner who makes more than you and no children, a trust may not be sensible in the short to medium term. If you have any questions about structuring your startup, get in touch with our startup lawyers. Fill out the form on this page or call us on 1300 544 755.